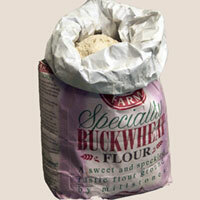 Occurrence: Buckwheat flour is used as a substitute for wheat flour in many recipes. It is frequently used in making savoury pancakes. These are called galettes or crepes de sarasin in France (buckwheat is known as “sarasin” or “blé noir” in France). It is also used in several types of Japanese noodles called soba, ramen, somen, or udon. Buckwheat, despite its name, is not botanically related to wheat. Thus individuals who are allergic to wheat, barley, rye and similar cereals can usually eat buckwheat. Similarly, buckwheat flour can be safely used by individuals with coeliac disease (provided that it has been milled separately from wheat, rye, barley or oats). Allergy to buckwheat is one of the more common food allergies in Korea and Japan. As with most food allergens, the most common symptoms involve the skin, especially urticaria (hives). Severe symptoms such as anaphylaxis have been reported and also exercise induced anaphylaxis i.e. anaphylaxis which only occurs when consumption is followed within a few hours by exercise such as running. Buckwheat is not named in the European or American labelling regulations but labelling of buckwheat is mandatory in Japan, reflecting the much higher prevalence of this allergy in Asia. Other Information: There are other species of buckwheat including Fagopyrum tataricum (Tartarian buckwheat) which is also cultivated and several wild relatives (http://www.ebi.ac.uk/newt/display?from=null&search=3616). Takahashi Y, Ichikawa S, Aihara Y, Yokota S.
[Buckwheat allergy in 90,000 school children in Yokohama] Japanese. Park et al (2000)  reported 19 patients with the following symptoms: angioedema (11/19), urticaria (18/19), dyspnea (15/19), Gastrointestinal (10/19)and loss of consciousness (2/19). Yoshimasu et al. (2000)  reported 12 patients with the following symptoms: cutaneous symptoms (9/12), wheezing or asthma (6/12), Gastrointestinal (6/12) and one each of discomfort of larynx, shock and anaphylaxis. Schiffner et al. (2001)  reported urticaria, nausea and mild laryngeal edema in one patient. Noma et al (2001)  reported a case of fatal exercise induced anaphylaxis. Tanaka et al. (2002)  reported data from 20 patients with positive CAP to buckwheat of whom 9 were food allergic, one reacted with asthma to buckwheat as an aeroallergen and 10 others did not show immediate symptoms on ingestion. Of the food allergic patients, 2/9 showed cutaneous symptoms only and 7/9 generalized symptoms. Food/Type of allergen:A commercial extract (Park et al. 2000 ). Protocol: (controls, definition of positive etc)1 mg/ml histamine was used as a positive control. Wheals larger than those observed for histamine were considered positive. Number of Patients:Park et al (2000)  tested 19 patients with buckwheat related symptoms and respiratory allergic patients without buckwheat related symptoms. Summary of Results:Park et al (2000)  found positive SPT from all 19 patients with wheals >8 mm. 15 asymptomatic patients also gave a positive SPT and were used as a control group. Park et al. (2000)  extracted defatted buckwheat flour with phosphate buffered saline. Nagata et al. (2000)  and Matsumoto et al. (2004)  extracted buckwheat flour with sodium bicarbonate. Tanaka et al. (2002)  extracted buckwheat flour with a sodium chloride/sodium bicarbonate solution. Park et al. (1997)  used the purified trypsin inhibitors BWI-1 and BWI-2b (see biochemical data). Park et al. (1997)  tested sera from 12 patients. Park et al (2000)  tested sera from 19 patients with symptoms and 15 asymptomatic patients with positive SPT. Nagata et al. (2000)  used sera from 9 allergic patients and 3 non-allergic controls. Noma et al (2001)  tested sera from a case of exercise induced anaphylaxis. Tanaka et al. (2002)  used sera from 20 patients with positive CAP to buckwheat of whom 9 were food allergic and one reacted to buckwheat as an aeroallergen. Matsumoto et al. (2004)  used sera from 14 buckwheat allergic patients (6 used in Nagata et al. 2000 ). Park et al. (1997)  found that 7/12 subjects were RAST positive for BWI-1 but that only one of five sera tested had more than 50% inhibition. The BWI-1 family are candidates for or components of the 9 kDa allergen. Park et al (2000)  found that all 19 allergic patients gave positive CAP as did 7/15 asymptomatic patients with positive SPT. The allergic patients' sera contained 0.53 to 53.5 kU/L buckwheat specific IgE (2/19 patients were below 1.0 kU/L). Tanaka et al. (2002)  found that CAP-FEIA gave 1.70-87.2 kU/L for buckwheat in the 10 patients buckwheat allergic patients. Patients without food allergy gave 1.17-18.7 kU/L. Noma et al. (2001)  reported RAST scores of 2 for soybeans, 3 for buckwheat, 2 for rice, and 3 for wheat in their patient. Matsumoto et al. (2004)  used 1D-SDS-PAGE with 10 or 15% gels with reduction of samples. Park et al (2000)  used 1D-SDS-PAGE with 13.5% gels with and without reduction of samples, which were boiled for 5 minutes. Nagata et al. (2000)  used 1D-SDS-PAGE with and without reduction of samples, which were boiled for 5 minutes. Yoshimasu et al. (2000)  used 1D-SDS-PAGE on 15% gels with and without reduction. Samples were boiled for 5 minutes. Tanaka et al. (2002)  used 1D-SDS-PAGE on 4-20% gradient gels with reduction. Samples were boiled for 3 minutes. Lee et al. (2001)  used 1D-SDS-PAGE on 4-20% gradient gels. Matsumoto et al. (2004)  and Nagata et al. (2000)  transferred proteins onto a PVDF microporous membrane (Immobilon, Millipore, MA). The membrane was incubated with patients' sera at a dilution of 1: 3, followed by the addition of alkaline phosphatase-conjugated anti-human IgG, IgE, or IgA (1 : 1000) and visualized by reaction with 5-bromo-4-chloro-3-indolyl phosphate (BCIP)/nitro blue tetrazolium. Park et al (2000)  transferred proteins onto a 0.45µm nitocellulose membrane by electroblotting. This was blocked with Tris and 5% (w/v) non-fat milk with Tween 20 and incubated with patients' sera at a dilution of 1:10, washed with Tris buffer with Tween 20 and incubated with goat alkaline phosphatase-conjugated anti-human IgE (1:1000), then visualized by reaction with 5-bromo-4-chloro-3-indolyl phosphate (BCIP)/nitro blue tetrazolium. Yoshimasu et al. (2000)  transferred proteins onto a nitocellulose membrane by electroblotting. This was blocked with Tris/BSA with Tween 20 and incubated with patients' sera at a dilution of 1:10, washed Tris buffered saline with Tween 20 and incubated with alkaline phosphatase-conjugated anti-human IgE or IgG, which was visualized by reaction with 5-bromo-4-chloro-3-indolyl phosphate (BCIP)/nitro blue tetrazolium. Tanaka et al. (2002)  transferred proteins onto a PVDF membrane. This was washed with PBS with Brij 35 and blocked with BSA. The membrane was incubated with patients' sera at a dilution of 1:10, followed by the addition of goat alkaline phosphatase-conjugated anti-human IgE, or IgA (1 :5000) and visualized by reaction with 5-bromo-4-chloro-3-indolyl phosphate (BCIP)/nitro blue tetrazolium. Lee et al. (2001)  transferred proteins onto a nitocellulose membrane by electroblotting. This was blocked with Tris/BSA and incubated with patients' sera at a dilution of 1:20, washed Tris buffered saline with Tween 20 and incubated with alkaline phosphatase-conjugated anti-human IgE, which was visualized by reaction with 5-bromo-4-chloro-3-indolyl phosphate (BCIP)/nitro blue tetrazolium. Matsumoto et al. (2004)  report the 24-kDa protein (BW24KD as the most prominent band, which was recognized equally by IgG, IgA, or IgE. The 10 kDa protein (BW10KD) was more strongly IgE reactive comparted with IgG or IgA, in 57% of allergic individuals. Park et al (2000)  identified by immunoblotting 24kD, 19kD, 16kD and 9kD proteins as major allergens. 30 kDa, 43 kDa and 67 kDa allergens were also found. The asymptomatic subjects also reacted to the 24kD, 16kD and 9kD proteins but only one to the 19 kDa proteins (this band is split). Nagata et al. (2000)  found 73, 70, 62, 58 and 54 kDa IgE binding bands without reduction. The 73, 70, 62 and 58 kDa bands gave 56 and 24 kDa, 52 and 24 kDa, 45 and 24 kDa and 43 and 24 kDa respectively on reduction. Yoshimasu et al. (2000)  found IgE reactive bands between 45-66 kDa and fainter bands at 14 and 18 kDa before reduction. After reduction, 45 kDa, 18 kDa and 14 kDa bands bound IgE strongly. The 6 bands at 45-66 kDa gave a protein band at 24 kDa after reduction which did not bind IgE. Tanaka et al. (2002)  found IgE binding to the 24 kDa protein in 19/20 sera and to the 16 and 19 kDa proteins in 9/10 patients with symptoms. As the 16 kDa protein was resistant to pepsin, they conclude it is associated with anaphylaxis. Noma et al. (2001)  reported 16, 20, 24, and 58 kDa bands. Lee et al. (2001)  report 21 bands from 120 to 4 kDa in food allergic subjects and 8 in asthmatics. Kondo et al (1993)  identified a 24kDa protein as a major allergen in sera tested. The allergen was a heterodimer, with paired components of different molecular weights . Food used and oral provocation vehicle:Buckwheat flour. A 50mg dose was used with a lactose placebo initially and doubled until 5g was administered (Park et al 2000 ). 8 patients showed positive responses up to 5g. Two negative subjects were positive to open challenge with boiled buckwheat. Schiffner et al. (2001)  reported anaphylaxis in a latex allergic patient on consuming a muesli bar which contained buckwheat. IgE in allergic sera to buckwheat cross-react with those from latex (De Maat-Bleeker & Stapel 1998 ) and rice (Yamada et al 1995 ). However, the patients with anti-rice IgE tended to be tolerant of buckwheat. In Korea and Japan buckwheat is a major paediatric allergen and also an inhalation allergen. Takahashi et al. (1998)  report that 0.22% of Yokohama school children are allergic to buckwheat. Husk and straw are used as furniture filling and aggravation of asthma by buckwheat chaff filled pillows has been reported (Lee et al., 2001) . Occupational asthma due to buckwheat flour inhalation has been reported (Park & Nahm, 1996) . Buckwheat flour is used as a substitute for wheat for coeliac and dermatitis herpetiformis patients. There is no apparent cross reactivity with wheat (de Francischi et al 1994 ; Matuz et al. 2000 ; Aubrecht & Biacs 2001 ). Primary structure and allergenic activity of trypsin inhibitors from the seeds of buckwheat (Fagopyrum esculentum M.) . Nagata, Y., Fujino, K., Hashiguchi, S., Abe, K., Zaima, Y., Ito, Y., Takahashi, Y., Maeda, K., Sugimura K.
Tanaka K, Matsumoto K, Akasawa A, Nakajima T, Nagasu T, Iikura Y, Saito H.
Davidson AE, Passero MA, Settipane GA.
Buckwheat-induced anaphlyaxis: a case report. Cross reactivity between buckwheat and latex. Identification and characterization of the major allergens of buckwheat. Electrophoretic and immunochemical characterization of allergenic proteins in buckwheat. Lee SY, Lee KS, Hong CH, Lee KY.
Three cases of childhood nocturnal asthma due to buckwheat allergy. Fatal buckwheat dependent exercised-induced anaphylaxis. Matsumoto R, Fujino K, Nagata Y, Hashiguchi S, Ito Y, Aihara Y, Takahashi Y, Maeda K, Sugimura K.
Molecular characterization of a 10-kDa buckwheat molecule reactive to allergic patients' IgE. Characterization of buckwheat grain proteins and its products. Structure and potential allergenic character of cereal proteins - II. Potential allergens in cereal samples. Immunological analysis of serum for buckwheat fed celiac patients. Buckwheat flour hypersensitivity: an occupational asthma in a noodle maker. Nature of main cross-reacting proteins:Not known. Allergen purification:Yoshimasu et al. (2000)  reported a purification of the 14 kDa allergen by reverse phase chromatography using a Source 15RPC ST 6.6/100 column (Amersham Pharmacia Biotech) equilibrated with 0.1% (v/v) trifluoroacetic acid. Samples were eluted with 0.1% (v/v) trifluoroacetic acid in 70% (v/v) acetonitrile. Yoshimasu et al. (2000)  report that the main IgE binding proteins ran between 45 and 66 kDa on non-reducing gels. With reducing gels, seven bands from 10-20 kDa were seen. There was no 24 kDa allergen. The strongest IgE binding was at 14 and 18 kDa. The N-terminal sequences of the 14 kDa band was KYEGALKRIEGEGCK. This distantly resembles rice phenylalanine ammonia lyase and rice endosperm protein. Calculated Masses:14593.86 Da (residues 23 to 149). Process, chemical, enzymatic:Stable to cooking in pancakes and noodles. Tanaka et al. (2002)  show that the 16 kDa protein is one of the most pepsin resistant buckwheat proteins. Nature of main cross-reacting proteins:IgE from buckwheat allergic individuals has been reported to cross-reacts with proteins from latex and rice. The 16-19 kDa allergens seem to be related to alpha-amylase/trypsin inhibitor family (including 2S albumins). Allergen purification:Yoshimasu et al. (2000)  reported a purification of the 18 kDa allergen by reverse phase chromatography using a Source 15RPC ST 6.6/100 column (Amersham Pharmacia Biotech) equilibrated with 0.1% (v/v) trifluoroacetic acid. Samples were eluted with 0.1% (v/v) trifluoroacetic acid in 70% (v/v) acetonitrile. The 18 kDa allergen purified in a double peak. Thus it is possible that a homologue of the BW8 kDa (BW10kD) allergen is not processed into two chains and runs at 16 to 18 kDa. Koyano et al (2006)  recently reported the full 149 amino acid sequence of the 16 kDa allergen, showing that there is a 22 amino acid signal sequence before the N-terminal sequence above. Koyano S, Takagi K, Teshima R, Sawada J. Process, chemical, enzymatic:Tanaka et al. (2002)  report that the 19 kDa protein is digested by pepsin under conditions where the 16 kDa protein is resistant. Allergen properties & biological function:Possibly a seed storage protein as it may be homologous to rice alpha-globulin. Park et al. (2000)  reported the N-terminal sequences of the 19 kDa allergen as GDYPLXCRQKIEH, which showed moderate homology to 19 kDa alpha-globulin of rice. Process, chemical, enzymatic:Most 2S albumins are relatively stable to both heat and proteolysis, probably because the structure consists of alpha-helices, which can quickly refold, crosslinked by 4 disulphide bridges. Allergen properties & biological function:Possibly seed storage protein by homology with other 2S albumins. Buckwheat was extracted twice with 0.125 M NaHCO3 at 4°C for 1 h, centrifuged and the supernatants dialyzed against distilled water. The extracts were loaded on an anion-exchange chromatographer (DEAE-TOYOPEARL 650M, Tosoh, Tokyo) that had been equilibrated with Na2HPO4 (20 mM, pH 7). After washing the column with the same buffer, the proteins were eluted with a linear gradient of NaCl ranging from 0 to 1 M NaCl in Na2HPO4 (20 mM, pH 7). The fractions containg the partially purified BW10kD were identified by SDS-PAGE. This is was initially described as the BW8kD allergen by Nagata et al. (2001)  and later called the BW10KD allergen by Matsumoto et al. (2004) . In 1D-immunoblots it may overlap the 9 kDa allergen of Park et al. (1997)  and Park et al (2000) . Purification and properties of allergenic proteins in buckwheat seed. Nagata Y., Fujino K., Hashiguchi S., Hirai T., Ito Y., Takahashi Y., Maeda K., Sugimura K.
N-terminal amino acid sequence of a 8 kDa buckwheat molecule reactive to allergic patients' IgE. Allergen epitopes:Yoshioka et al (2004)  have identified 8 epitopes as residues 13-20, 37-44, 64-69, 87,92, 113-118, 135-144, 159-164 and 179-188. Mutation to alanine or methionine was used to identify some residues involved in binding IgE. Process, chemical, enzymatic:Some buckwheat allergens are known to be stable to cooking. Nature of main cross-reacting proteins:The buckwheat legumins listed above share more than 80% identity with each other and would be expected to cross-react. They would also be expected to cross-react with 11S seed storage globulins from other species of buckwheat such as Q9M642 (fragment) from Fagopyrum gracilipes and Q8LGR7 from Fagopyrum tataricum (Tartarian buckwheat). Allergen properties & biological function:The legumins are seed storage globulins. Kondo et al (1993)  identified, by immunoblotting, a 24kD protein as a major allergen in sera tested. The allergen was a heterodimer, with paired components of different molecular weights . There are additional 13S legumins from Fagopyrum esculentum (Common buckwheat) such as Q84MJ4, which are very distantly related and would probably not cross react. Urisu, A., Kondo Y, Morita Y, Yagi, E., Tsuruta, M., Yasaki. T., Yamada, K., Kuzuya, H., Suzuki, M., Titani, K., Kurosawa, K.
Isolation and characterization of a major allergen in buckwheat seeds. Nair A., Ohmoto T., Woo S.H., Adachi T.
A molecular-genetic approach for hypoallergenic buckwheat. Fujino K, Funatsuki H, Inada M, Shimono Y, Kikuta Y. Expression, cloning, and immunological analysis of buckwheat (Fagopyrum esculentum Moench) seed storage proteins. Yoshioka H, Ohmoto T, Urisu A, Mine Y, Adachi T.
Expression and epitope analysis of the major allergenic protein Fag e 1 from buckwheat. Protein Family:PF00280; Type I potato serine protease inhibitor family. Process, chemical, enzymatic:The inhibitors function after heating, exposure to organic solvents and low pH during extractions. Thus they are either very stable or else can easily refold. They would be expected to survive cooking. Nature of main cross-reacting proteins:These inhibitors are similar to inhibitors from Amaranth (eg. P80211). Allergen purification:Bolozersky et al (1995)  followed an initial extraction from the seed by either a trypsin-Sepharose column or Sephadex G-75 followed by chromatography on Mono Q HR 5/5 in 20 mM K, Na-phosphate, pH 6.8. Protein was eluted by a 0-100 mM NaCl gradient. BWI-1 was then purified by reverse-phase HPLC on a aquapore RP-300 column using a acetonitryl gradient. Pandya et al. (1996)  stirred 250 g batches of flour with 2.5l of 2% (w/v) NaCl for 90 min. This was filtered and centrifuged. The supernatant was heated to 80 deg. C for 10 min. Ammonium sulphate was added to 60% saturation. The ppt. was disolved in water, dialysed and lyophilized. The protein was disolved in 6M urea in 0.1M acetic acid and fractioned by gel filtration (Sephadex G-50 equilibrated in 0.1M acetic acid). Fractions were lyophilized and applied to an inactivated trypsin column at pH 8.1. The inhibitors were eluted at pH 2.1 in 0.1M KCl, desalted and lyophilized. The protein was then chromatographed on DEAE-Sepharose CL-6B equilibrated with 50 mM Tris, pH 8.4, with a 0-0.3M NaCl gradient. Peaks were rerun on a Synchropak AX300 HPLC column in 10 mM Na-Pi buffer and eluted using gradients 0-0.2M and 0,2-0.6M NaCl. Park et al. (1997)  extracted defatted flour with 10 mM sodium phosphate, pH 7.5, containing 0.15M NaCl with agitation for 2 hours at 4°C. After centrifigation (20 minutes at 13000g), ammonium sulfate was added to 100% saturation and precipitate was collected after 24 hours by centrifugation. After dialysis against 10 mM sodium phosphate, pH 7.5, and gel filtration on Sephadex G-50, the trypsin inhibitory fractions were collected. These were further purified and separated on a DEAE-cellulose column equilibrated with 10 mM Tris/HCl pH 8.0, with elution by a linear 0-0.3M NaCl gradient, followed by purification on an FPLC Mono-Q column and RP-HPLC on a Wakosil C-18 column. Pandya M.J., Smith D.A., Yarwood A., Gilroy J., Richardson M.
Complete amino acid sequences of two trypsin inhibitors from buckwheat seed. Belozersky M.A., Dunaevsky Y.E., Musolyamov A.X., Egorov T.A. Complete amino acid sequence of the protease inhibitor from buckwheat seeds. Process, chemical, enzymatic:The inhibitors function after heating, organic solvents and low pH during extractions. Thus they are either very stable or else can easily refold. They would be expected to survive cooking. Allergen properties & biological function:These allergens are serine protease inhibitors. Allergen purification:Pandya et al. (1996)  stirred 250 g batches of flour with 2.5l of 2% (w/v) NaCl for 90 min. This was filtered and centrifuged. The supernatant was heated to 80 deg. C for 10 min. Ammonium sulphate was added to 60% saturation. The ppt. was disolved in water, dialysed and lyophilized. The protein was disolved in 6M urea in 0.1M acetic acid and fractioned by gel filtration (Sephadex G-50 equilibrated in 0.1M acetic acid). Fractions were lyophilized and applied to an inactivated trypsin column at pH 8.1. The inhibitors were eluted at pH 2.1 in 0.1M KCl, desalted and lyophilized. The protein was then chromatographed on DEAE-Sepharose CL-6B equilibrated with 50 mM Tris, pH 8.4, with a 0-0.3M NaCl gradient. Peaks were rerun on a Synchropak AX300 HPLC column in 10 mM Na-Pi buffer and eluted using gradients 0-0.2M and 0,2-0.6M NaCl. Bolozersky et al (1995)  made an extract from seeds and used either a trypsin-Sepharose column or Sephadex G-75 followed in each case by chromatography on Mono Q HR 5/5 in 20 mM K, Na-phosphate, pH 6.8. Protein was eluted by a 0-100 mM NaCl gradient. BWI-1 was then purified by reverse-phase HPLC on a aquapore RP-300 column using acetonitryl and trifluoracetic acid. Other biochemical information:A range of allergens have been identified by immunoblotting including ones with Mrs of 24kD, 19kD, 16kD and 9kD proteins. Park et al. (1997)  tentatively identify these sequences as distant homologues of the cysteine rich N-terminal domain found in some vicilins. Alignment with Jug r 2 and AMP2 from Macadamia nut show 13/37 identities including four cysteine conserved in several vicilins. AMP2 has been shown to be cleaved to produce a family of antimicrobial peptides ( Marcus et al. 1999 ). Tsybina TA, Dunaevsky YE, Musolyamov AK, Egorov TA, Belozersky MA. Cationic inhibitors of serine proteinases from buckwheat seeds. Marcus JP, Green JL, Goulter KC, Manners JM. A family of antimicrobial peptides is produced by processing of a 7S globulin protein in Macadamia integrifolia kernels.